In its report, the Commission of Inquiry released accuses North Korea of crimes against humanity. Sixty-one years after the Korean Peninsula was divided, the United Nations notes that "Crimes against humanity are ongoing" under the Kim regime "because the policies, institutions and patterns of impunity that lie at their heart remain in place." But for analysts and experts, as good as the report might be, its actual effect is questionable. Seoul (AsiaNews) - The official report on the situation of human rights in North Korea has caused an uproar in China and North Korea. Both countries have rejected accusations of "atrocities" and "crimes against humanity" levelled at Pyongyang, calling instead on the United Nations not to go any further or take the Kim regime to the International Criminal Court. The North Korean government has not formally answered the charges, except to note that it is not party to the international bodies that launched the investigation (UN Commission on Human Rights or the International Court of Justice), and described the report as a "political plot" by "the EU and Japan, in alliance with the US hostile policy." China is directly mentioned in the 372-page report. According to many witnesses, China's attitude and its policy of forced repatriation of refugees from the North are a form of complicity in crimes against humanity. In Beijing, a Foreign Ministry spokesperson said that repatriation is a bilateral matter beyond the jurisdiction of the United Nations. The Commission of Inquiry on Human Rights in the Democratic People's Republic of Korea presented its report yesterday in Geneva. The commission is made up of retired Australian High Court Justice Michael Kirby, veteran human rights activist Sonja Biserko and UN Special Rapporteur Marzuki Darusman. The report's detailed findings are based on the accounts of 80 witnesses and will presented to the United Nations Human Rights Council at its 25th regular session in Geneva on 17 March 2014. The witnesses are North Koreans who fled their homeland and spoke in four public hearings in Seoul, Tokyo, London and Washington. Their identities were not disclosed for security reasons. The Commission also held 240 confidential interviews. Witness said that hundreds of thousands of people have died in labour camps, people imprisoned for political, religious or social reasons. According to the report, the camps are an area of lawlessness (housing some 300,000 people), where workers are forced to live and die like animals, subjected to sexual violence and torture, under perpetual psychological coercion. There is nothing new in this situation - it has existed for 61 years, ever since the peninsula was divided into two at the end of the Korean War. Backed by China, the Kim family continues to rule North Korea. Kim Il-sung, the first dictator, chose a policy of autarchy and isolationism, violently destroying religions and other political parties. 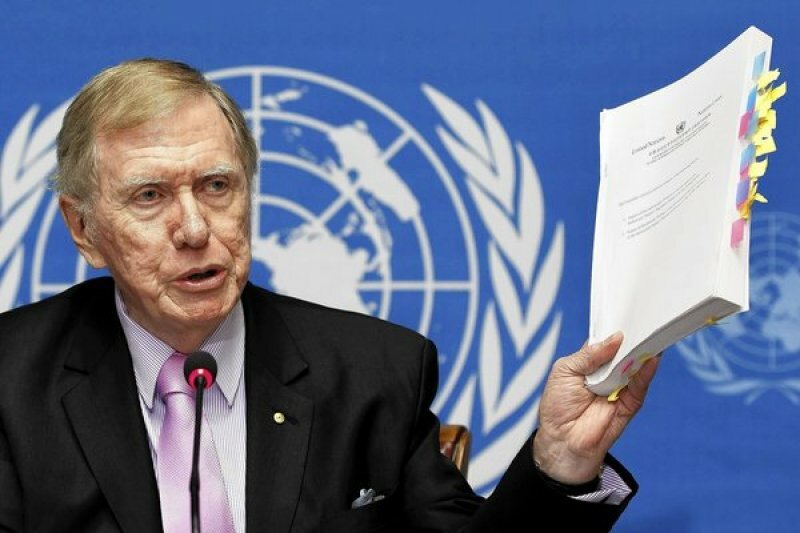 At the end of the press conference presenting the report, retired judge Michael Kirby said the world could no longer plead ignorance as an excuse for failing to stop human rights violations in North Korea. "At the end of the Second World War, so many people said: If only we had known . . . . Now the international community does know," he said. "There will be no excusing of failure of action because we didn't know." Still, analysts and experts wonder how the United Nations can compel Pyongyang to stop its terror policies. One way would be to refer the case to the international Criminal Court, but that would require the approval of the Security Council of the United Nations where China has a permanent veto. Jared Genser, an international human rights lawyer and an expert on North Korean abuses, said: "It is exciting but also risky that the commission appears to have requested the Security Council refer the situation in [North Korea] to the International Criminal Court. There is no doubt that legally such a referral would be highly justified and appropriate. But it is also bound to infuriate China." "During the course of the commission's investigation, researchers seem to have come to a fuller realization of the severity of the human rights situation in North Korea," said Yun Yeo-sang, director of the Database Center for North Korean Rights. "The information contained in the report," he added, "is much more advanced than we had originally thought."